In our last living room we cultivated what we call an Art Wall. I can’t remember how we came to the decision to cultivate an art wall, maybe it was a Pinterest thing? We decided on a theme for our decorating scheme and then slowly added pieces that fit. One year for Christmas we put Starry Night Over the Rhone by Vincent Van Gogh on our Christmas list. After we received this first print we decided we should design our wall. We picked out the frames at Michaels, designed an arrangement and went to work filling the frames. Now in our new apartment it’s going to be an art filled Portico. 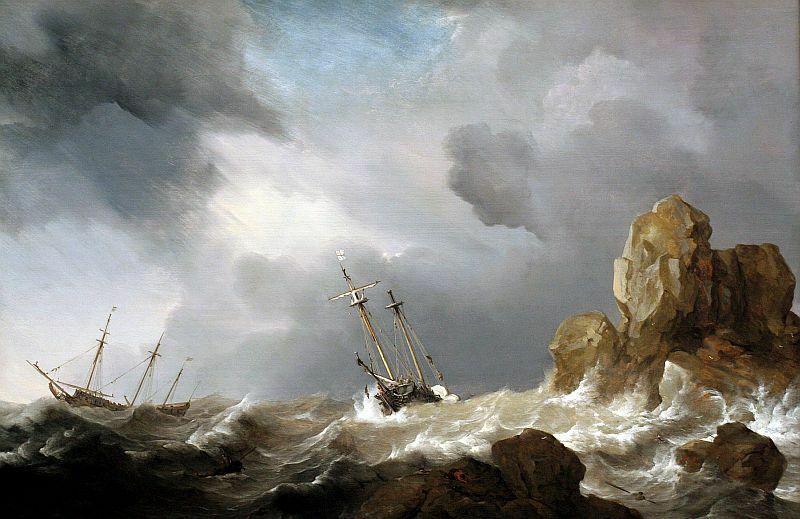 Ships in a Gale is one of the most thought provoking pieces I selected. It has such powerful imagery for me and reminds me that God is in charge of the wind and the seas. No matter my circumstances, no matter my storms, He is Creator and over all. With just the sound of His voice He can make this tumultuous scene be still. I set this painting as my background on my laptop and shared it with a coworker, she was shocked and appalled by it until I told her what it represented to me. You see, when she looked at it she saw imminent danger and destruction for the ships and an angry sky and sea. I look at it and am reminded that even in turbulent seas, my God is powerful enough to keep me safe, protected and at peace.